Jan 1, 2016 | Love This! Type of Plant: An evergreen perennial for part-shade that flowers in the wintertime. These plants are hardy in zones 5-9, grow about 8 inches tall and 12 inches wide. Why I Love This: This variety of Helleborus niger starts flowering earlier than most and continues through March in my garden. The flowers are white and age to pinkish in cold weather or green when it’s warmer. Another plus is that ‘Jacob’ has flowers that face outward instead of down, and the plant is quite compact. A Word to the Wise: I’ve found that it can be hard to find these plants in the late-spring but often garden centers have them from Thanksgiving into early December. But ask at your local garden center during the growing season as well because if you plant your hellebores early in the season they will get larger and gain strength and have more flowers come the following winter. 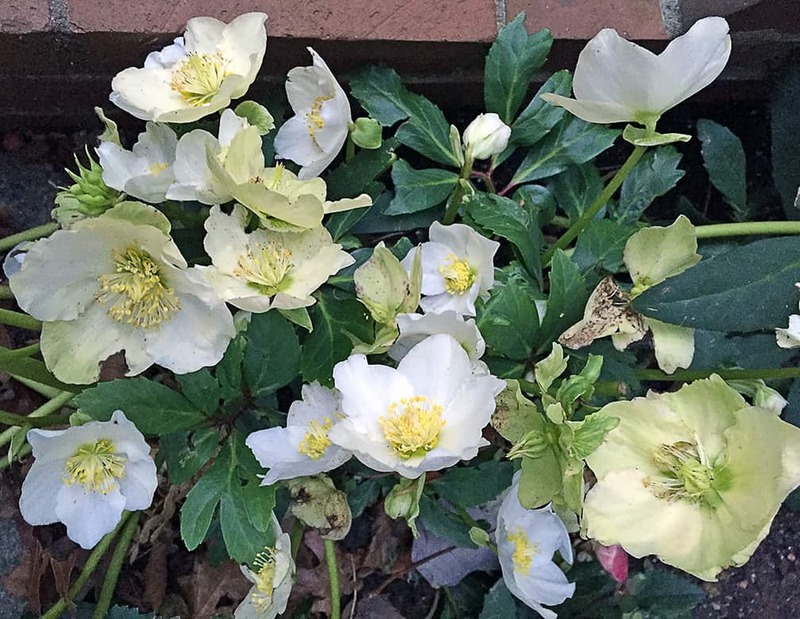 Note that most people drop the HGC, which stands for Helleborus Gold Collection, the trademark name for this series of plants, and just call this plant Jacob. My Jacob hellebores are growing in a spot where they get morning sun (four hours in the summer but very little in the winter) and afternoon shade. They thrive! This photo shows that it’s been on the warm side in December because the aging flowers are turning green not pink. Next week the temps are going down, so the flowers will most likely change color.